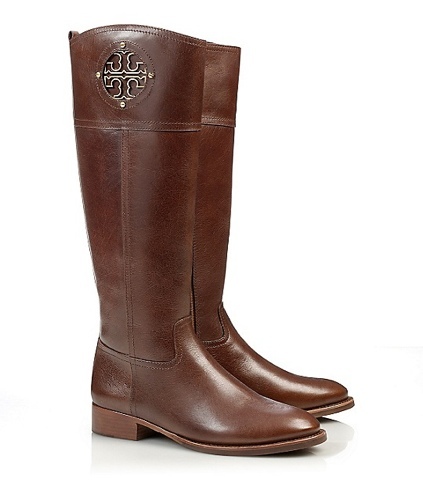 For several years, I've lusted over the brown Tory Burch riding boots. I came rather close to making a purchase last year. My friend and I cradled them like babies and she gave me 2356 reasons why I should go for it. The excuses I provided were all about practicality. $500 is a lot of money to spend on boots in my world. What if I got caught in the rain wearing them? I couldn't bear the thought of ruining them so carelessly. They were extremely valid points. So I put them down and we went to Anthropologie where I most likely spent $500 on a few tops I can't even recall. I regret that decision. It haunted me throughout the whole winter. I opted for a less expensive pair of boots that I wore the mess out of. Literally. To the point that they need to be re-soled. They cannot be worn if it has rained. Water soaks straight through the soles and my feet are left wet and cold. So this fall, I've made up my mind to do two things: take last year's pair to the cobbler to be repaired and bit the bullet and purchase these beauties. Am I right or am I right? They're absolutely even more gorgeous in person. I swear it. Last year's cheaper pair will be worn on rainy days and perhaps I'll purchase some Hunters as well. And that leaves these guys to be showcased for the dry days. It's a plan. 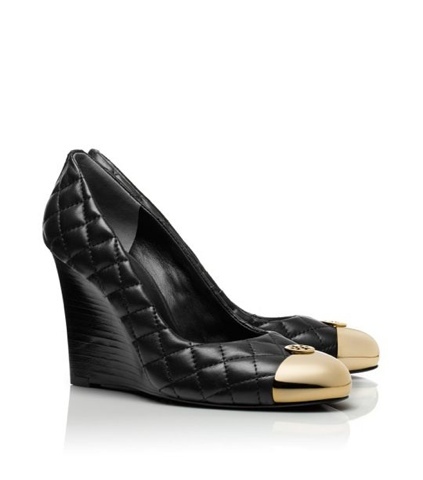 Also spotted on the Tory Burch website were these quilted wedges. I'm really liking the detail from the quilting to the gold toes. I'll be sure to go up a size since my TB flats were purchased one size too small. If you have any input on if TB's wedges fit the same way her flats do, please let me know as I don't want another pair of expensive shoes that are too tight. You should also know that these jelly flats are currently on sale. I can't help but love these not only for how cute they are, but also the nostalgia they bring. I lived in jelly shoes as a little girl and a part of me misses those days. I think these would be perfect summer rain shoes as well!! Also on sale, these cute wedges. I saw a girl in my office wearing these last week with the cutest bright coral floral print skirt and chambray button down. It was such a show stopper. I literally sent LILO a gchat and said, "please tell me you have seen the chambray blogger chic outfit happening in the office right now." oh my god im loving the brown wedges....sigh.. I have the brown wedges, and they run true to size for me. But I've also been told by the TB ladies that each shoe fits differently (even the same style shoe)so you really need to try them on. I went up an entire size for my TB sandals. So weird.